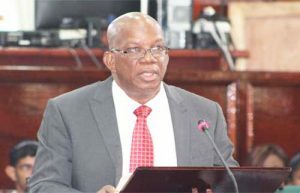 Finance Minister, Winston Jordan agrees that the salaries for employees at the Environmental Protection Agency (EPA) are indeed poor. He said however, that instead of looking to the Government to make increases available from the national purse, the agency must seek innovative ways to do so on its own. On this note, Jordan said that the agency needs to review its fees. The Minister also stressed that the EPA is a semi-autonomous agency and that it does not have to subscribe to the salary scale used by the Public Service Commission. Head of the Environmental Protection Agency, Dr. Vincent Adams had told this newspaper that he would petition the Government for more funds in an effort to boost the paltry pay of his officers. His reason for doing so is premised on concerns from local and international transparency advocates that the poor salaries of EPA officers make them more susceptible to the influence of corrupt oil companies. Dr. Adams noted that this is a serious concern of his. He said too that he notes the importance of the issue, especially since the EPA will be one of the key regulators of the oil and gas sector. Poor salaries and the absence of a pension plan are just two of the major factors deterring much needed qualified personnel from joining the Environmental Protection Agency. This was noted by Chartered Accountant and former Auditor General, Anand Goolsarran. In his forensic audit report on the agency, Goolsarran said the EPA needs about 160 professionals to be effective but the emoluments are not adequate to attract suitably qualified and trained personnel as salary scales are similar to those of the traditional public service. In this regard, the Chartered Accountant highlighted that the position of a legal officer attracts a salary of $262,107 per month, while the Finance Officer who is professionally qualified earns $226,362 per month. The auditor also expressed concern about the fact that Ministry of Natural Resources is overly involved in the recruitment process. In terms of retirement benefits, the former Auditor General said that the EPA does not have a pension plan. Further to this, Goolsarran said that while most of the officers are required to be in the field, they do not benefit from duty-free concessions to assist them to acquire their own vehicles. What is also worse in Goolsarran view is the fact that the agency has a limited number of vehicles that can be used to undertake field trips. Given the age of these vehicles, operating and maintenance costs are high, said Goolsarran.